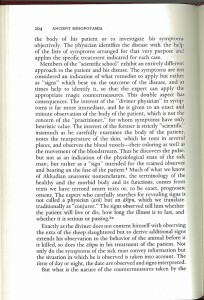 In their impressive compilation of Assyrian and Babylonian medical fragments JoAnn Scurlock and Burton R. Andersen remark about the āšipu: “like intellectuals everywhere, it was not possible for him to approach a medical problem without bringing to it a bit of preconceived theory.” Their observation holds true for modern intellectuals (in this case, a psychologist and a psychiatrist) just as it did for the magico-medical āšipu, as the recent “Nothing New under the Sun: Post-Traumatic Stress Disorders in the Ancient World” demonstrates. When I tweeted about this article a few days ago, I assumed it was another attempt to foist our comfortable diagnostic categories onto the past. My skeptical tweet about this article. Although efforts to retrodiagnose diseases have a long pedigree, they remain fraught with difficulties. Historians of medicine have argued that such efforts are fundamentally flawed, mistaking ontological categories and distorting evidence for modern purposes. Along with such theoretical challenges, attempts to identify in past descriptions of symptoms our modern diseases run into the problem of evidence: the historical record is often too fragmentary and ambiguous and imprecise to justify such identification. Or rather, any number of diagnoses are plausible given the vague and patchy descriptions of illnesses in the past. These difficulties, however, seem to be no impediment for the determined “scissors-and-paste” researcher armed with a pair of sharp Metzenbaums and ready to excise choice quotations in an effort to demonstrate the timeless truths of our current knowledge. In some ways, “Nothing New Under the Sun” confirmed my suspicions; in other ways it surpassed my wildest fears. The authors brought their preconceived theory to bear on six Assyrian medical fragments and discovered exactly what they sought: PTSD. Where the article broke new ground, however, was its scholarship: the deeply problematic footnotes and the misleading interpretation of what other scholars had written. I checked the two sources readily available to me—A. Leo Oppenheim’s Ancient Mesopotamia: Portrait of a Dead Civilization (Chicago, 1977) and JoAnn Scurlock and Burton R. Andersen, Diagnoses in Assyrian and Babylonian Medicine (Urbana, 2005)—and found a number of problems. I appreciate that these are significant charges, so I offer below a catalog of the issues I consider problematic. If my interpretation of these examples is wrong, please correct me. Page 294 Oppenheim’s Ancient Mesopotamia makes no reference to cuneiform texts, per se. Page 294 of Oppenheim doesn’t say anything about cuneiform texts or how many might deal with medicine. Our knowledge of the nature and the extent of Mesopotamian medicine is based on medical texts, consisting of handbooks and collections of prescriptions, supplemented by letters, references in the law codes, and allusions in literary texts. While it is unclear to me where or if Oppenheim supports any of these claims, it is clear that page 294 does not corroborate them. Their source here, Scurlock and Andersen, do mention trauma and warfare on page 345 of their book, where they say: “The armies of Assyrian kings contemporary with the bulk of the surviving medical texts were protected by shields, ….” In other words, most of our medical texts come from a period when armies had shields, helmets, and suits of armor. It seems a rather significant misreading to say “the majority of cuneiform medical texts on trauma were concerned with war wounds.” Maybe there is another source that backs up the claim made in “Nothing New,” but the page cited in Scurlock and Andersen doesn’t. Page 345 in Scurlock and Andersen doesn’t seem to say what “Nothing New” thinks it does. The causal, “because of the frequent wars during the Assyrian period,” is again a rather significant misreading (over interpretation grounded in a preconceived theory?) of Scurlock and Andersen, who qualify their interpretation in two ways, saying: “in periods when [my emphasis] wars were frequent, a significant portion of the male population was subjected to the stress of battle in one campaign season out of every three” and “…it is likely that a portion of these draftees [my emphasis] experienced battle fatigue (post-traumatic stress syndrome)” (438). 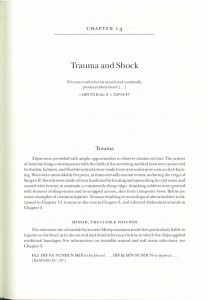 The text cited in footnote 36, Scurlock and Andersen, Diagnoses, 351, does discuss post-traumatic stress syndrome, but qualifies it saying the “quotes below may [my emphasis] be describing this syndrome [PTSD].” The careful qualification has been lost in “Nothing New.” Further, the highlighted section above is a word-for-word quotation without quotation marks. Note 37 is wrong. The explanation of square brackets on page 576 refers to the tables that follow, not the translations of the texts. Square brackets and ellipsis in the translations are explained on page xvi: “An ellipsis in square brackets indicates a missing section of text whose restoration is uncertain” (Scurlock and Andersen, Diagnoses, xvi). These unrestored parts of the translation further highlight the fragmentary nature of the texts. Page 429 of Scurlock and Andersen’s Diagnoses mentions ghosts among gods, goddesses, demons, demonesses, and demonic forces, e.g., curses and sorcery, but nothing about the ghosts of killed enemies. In fact, warfare and enemies are absent from that page, and the following one. After checking a third of the notes in “Nothing New,” I am suffering from Post-Traumatic Article Disorder, which prevents me from finding the other scholarship cited and checking the references to it. Of the sixteen notes I was able to check, nine are wrong or problematic (another three or four are worrisome, but not egregious). I don’t want to impute malfeasance to the authors of “Nothing New.” I will, however, deplore the scholarship that doesn’t rise to the level I would demand of an undergraduate. If my reading of this article and its notes is accurate, I cannot understand how or why a history of science journal accepted and published it.